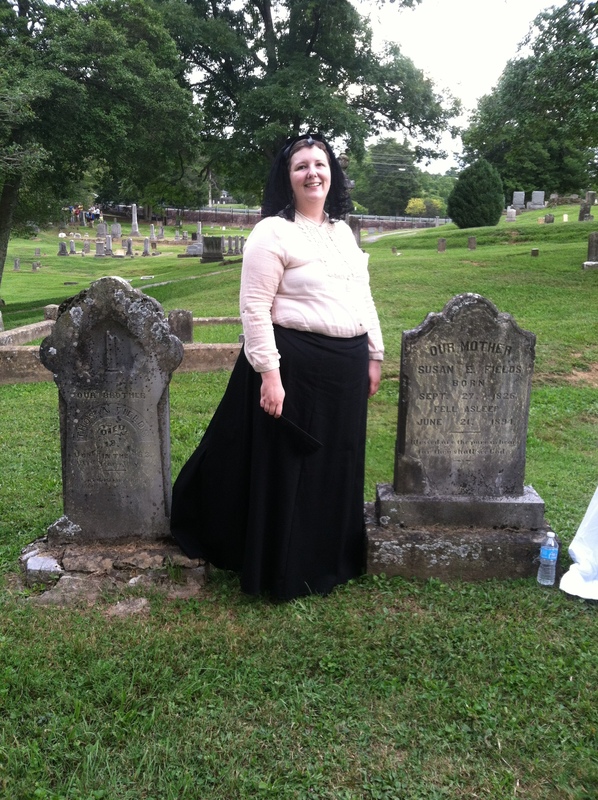 August 2–The Historical Society of Washington County, Virginia hosted a Living History Cemetery tour of Sinking Springs Cemetery in Abingdon, Virginia. Sinking Springs Cemetery, located on Russell Road, is the burial site of many of Abingdon residents, including James and Susan Fields. James and Susan lie in the “Lower Penn” section of the cemetery, with their sons Thomas and Samuel and daughter, Mary Annis, buried nearby. Susan rose from her sleep for a special appearance during the Living History Tour. Susan discussed life with James and the Fields’s eight children, including the loss of son Thomas (died at age 23). Susan commented on James’s accomplishments, including his reconstruction of the Washington County Courthouse after the Civil War. Before Susan returned to her eternal rest, she stopped to pose for portraits.